Bay of Quinte fishing Charter. May, October & November are the best times for a walleye charter leaving from Picton, Ontario. The main target species is Walleye, with the incidental Pike or Sheephead/Freshwater Drum. Spring walleye are traditionally 2-8 lbs., while the fall walleye can be 2-15 lbs. 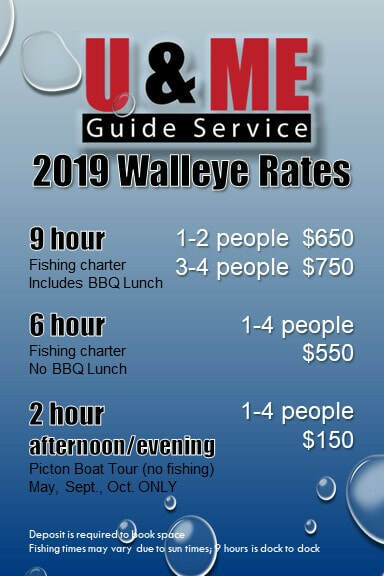 Whether the rods are screaming all day, or more difficult to attract, we're confident that you'll enjoy your fishing adventure with Captain Lloyd, your complimentary BBQ (on-boat) lunch, and go home with some new-found walleye knowledge. "HUGE thanks to Lloyd for a great day on the water. He was constantly working on finding us fish and I will definitely be going out many many more times with him!" Dan B.
Gnoddy "Best Day of Fishing I Ever Had"
JohnnyB "UandMe and a Whole Lotta Walleyes"
Bukee "Fishhunter Gets Er Done on the BOQ"
Pikeie "Bay of Quinte Report"
Terry "BOQ 3 Days of Gold"
Cancellation policy: 30 days notice for refund of deposit. If date can be re-booked, a full refund can be applied to the new booking.